When you set off to discover Athens, you will be surprised by the amount of amazing vantage points the city has to offer. Due to its unique geography, Athens offers a number of places to visit and take-in the extraordinary views over the city and all the way to the sea! 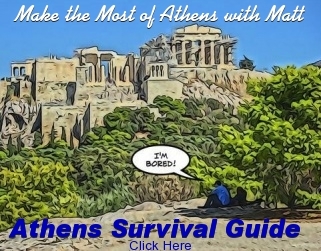 Get ready to feel on the top of the world at one of our favorite viewpoints in Athens. The Acropolis, Athens’ eternal landmark, offers some of the most extraordinary views in the city. Standing proudly on a high hill, the Acropolis is the most visited landmark in Athens-not only for its historical importance but also for the bird’s eye views to the city below. The Acropolis may be a rather predictable choice, however, it is the most stunning location in Athens if not in the whole of Greece. Lycabettus is the highest peak in Athens and an iconic landmark of the city. At 300 meters above sea level it offers unsurpassed views of the city; on a clear day, you can see the island of Aegina shimmering in the horizon. The top of the hill can be reached by foot, but the easiest way to get there is via the cable car that runs every half hour from the station on Aristippou street. Mount Lycabettus is home to the picturesque chapel of St. George, a restaurant, and an open air theater. The views from the hill are particularly amazing at night time! Named after the monument of Philoppapos that was discovered in the area, this hill captures Greek history, ancient and modern in a single image. Walking up the marble paved path and you will pass the tiny church of St. Dimitrios Loumbardiaris and The Shrine of the Muses which is cut into the rock just below the hill’s summit. From the top of the you’ll be able to take some amazing pictures of the Parthenon, the Odeon of Herodes Atticus, the Acropolis Museum, and the Athens Observatory. The hill is surrounded by a beautiful park and is a favorite kite drifting spot on the Greek Kathara Deytera - Clean Monday holiday. Other excellent places to savor awe-inspiring views of central Athens are: Strefi Hill near Exarhia, the Athens National Observatory on Nymphon Hill, and Areopagus Hill near the Acropolis. If you have some extra time on your hands we highly recommend taking the short trip to the floodlit Temple of Poseidon in Sounion to watch the sun set into the Saronic Gulf and the moon rising up over the sea!